Ad from 1930s Civic Repertory Theatre of Los Angeles program courtesy J. Eric Lynxwiler. In naming their brand of toroid treats “Optimistic Donuts,” the Davis Perfection Bakery, located near Los Angeles City Hall, referenced the old saying, “The optimist sees the doughnut; the pessimist sees the hole.” It was an odd enough name to draw attention. 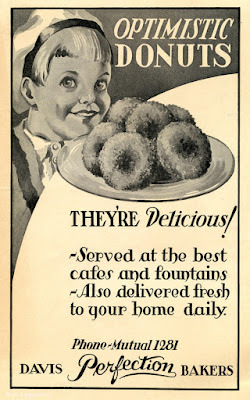 To draw even more attention, they also sponsored "The Royal Order of Optimistic Donuts" radio show on KNX radio on Friday nights from 1925 to 1934. This vaudeville-like variety revue was hosted by ad man Bert Butterworth and featured a wide variety of guests, from Morey Amsterdam to Willie Best to Minnie Pearl. The show was unusual for its time in featuring a largely black cast, including talents like Hattie McDaniel, who went on to bigger and better things. The house band was "The Optimistic Do-Nuts,” a creole jazz band led by piano player Sam McVea. In the early 1910s, McVea’s live performances had provided the soundtrack for seemingly every big party in town. KNX’s strong broadcast signal and the limited interference of the 1920s airwaves meant that the show was often heard all across the western half of the United States. And beginning in 1928, the show was also broadcast by KYA in San Francisco. That same year, the L.A. Times wrote, "Bert Butterworth at 8 p.m. will hold his weekly frolic over KNX. The studio-free-for-all affair has been going on as a Friday night feature almost since the station opened four years ago. It has its ups and downs, of course. Sometimes it is good and at other time it is mediocre. But on the whole, the various performances average up to an hour of wholesome entertainment." In the late 1930s, Davis Perfection Bakery also fielded a good women's softball team, which also called the Optimistic Donuts. They were based in Hollywood and often faced off against such powerhouses as the Orange Lionettes. This is a nice ad that the bakery has projected. The times have changed so the advertising and marketing methods have also changed a lot. However, its a good poster ad.